I have been seeing on all my friends' blogs about how Shutterfly is giving away 50 free holiday cards!! I love Shutterfly and especially their holiday cards. I actually just ordered my Christmas cards from them a week ago so you can imagine how I feel now that I could have received them for free. But, I can always use more cards especially because I keep on remembering people who I want to send a card to who I had previously not counted for. It was hard for me to pick which one I liked best because there was so many great ones to choose from. I will not spoil which own I chose but I will say that it's colorful and not the traditional red and green. Not only does Shutterfly have Christmas cards but they also have the cutest birth announcements. They have great picture books and I have made 3 of from them so far. It's super easy to do and you can even just upload pictures and they will make it into a book for you! I just made Jade a Halloween book with pictures of her in her costume and all of her friends and cousins in their costumes too. She loves it! I have also have made 4 of their picture calendars. They now have desk calendars that can be a great present for your husband to use on their work desks. I have used Shutterfly many many times and have loved everything that I've ordered through them! Check it out for yourself! Today we headed to the Grove to see a musical show in Pottery Barn Kids and to see Santa. 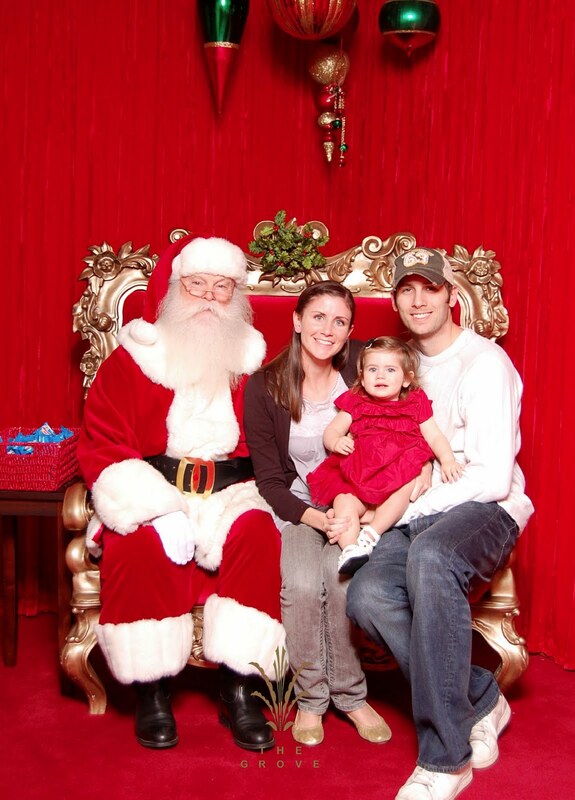 She loved the music but screamed the whole time with Santa. She was already crying waiting in line so it made seeing Santa worse. We will have to try it out again some other time. These are some funny videos of her dancing to the music! We went to the Zoo this week with Macy and Nate. Here are some pictures of the fun we had! at least she got a little taller. Last time she was below average in height and still over in weight. if you have been around her at all you know that this girl can TALK. I really have never heard someone her age speak so well. She has so many words I can't even count. She pretty much can say anything. She now puts 3-4 words together. She just came up to me and said, "read cupcake book please." The other day she came up to me with a plastic plate and spoon and said, "mmm pasta good!" She still loves Elmo and everything Mickey Mouse. She also has been getting into the whole princess thing. She loves Tinker Bell! She still takes 2 naps a day! The first usually an hour and the second 2 hours. I'm going to hold onto the 2 naps as long as possible! She has 11 teeth and is currently getting all the rest of them. Hahaha, now she is eating breakfast and is saying, "more more more breakfast and yogurt." Which brings me to my next point, this girl can EAT! She never wants to stop. I really think I've never seen her full. Just like daddy! She loves her friends and says their names all day long. She loves to spin in circles and will spin and spin until I make her stop. She loves to drum on everything. I need to get her a little drum! She loves music and will just stand and listen for a long time. In the car one of her songs are on at all times and she lets me know if she doesn't like the one that's on. She is picky in her choice of music. Loves airplanes and has been on 30 flights already! She loves reading books. Her favorites are: If you give a cat a cupcake, Pinkalicious, If you take a mouse to the movies, Who loves the Little Lamb. She knows almost every word to the books too. She gets sick of reading the same books over and over so we go to the library a lot. When she doesn't want to do something like brushing her teeth she closes her eyes and hides and thinks I can't see her. It's so funny. Her favorite time is when Dan gets home and we run to meet him at the bus stop. Here is a video of her that I took yesterday. She took her baby basket and made it into a hat and then took a ribbon and was running around saying kite. She's a silly girl and we love her! This year we went to Sacramento for Thanksgiving and was able to spend time with my entire family minus Chandler who is still in China. We missed you Chan!! We had a blast!!! Here are some of the fun things we were able to do while being home. Sorry, it's a lot of pictures. You will notice Jade still likes to say cheese when she sees a camera so it was hard to get any good ones of her. We took all the kids to do the Thanksgiving dinner shopping. What were we thinking??? Best friends..NOT! Jade has never hit any other kid until this weekend. Every time Claire came near her she would hit her away. Already cousin rivalry. Hopefully they will grow to be good friends. Black Friday!! This isn't even all the stuff we got. My mom's bags and our new TV were in another room! We went for a vintage theme for the Thanksgiving table. I was able to meet up with Tasha for lunch one day. Yes Jade is picking her nose. It was the best one! Our last night we all went to John's Incredible Pizza. It is like a Chuck E Cheese on steroids. It was soo fun!! You know the claw game where you can win a toy but nobody ever does? Well, we won it 4 times!!! Jade's favorite part of the night was the two dog balloons she got. She would not let go of them. Here she is eating while not letting her dog go. Here is the winnings of the claw game! What a fun trip..see you all soon for Christmas! !